It is only 73 degrees outside right now. I think that is the coolest it has been since I moved to New York. The boyfriend is in town for the weekend and I cannot wait to get outside and take advantage of the drop in temperature. Tomorrow morning we head to Philadelphia for the day to visit the neighborhood where my boyfriend grew up, picnic in Valley Forge and if I’m lucky, eat a cheesesteak on South Street before heading back to New York. Before I get started with all of that, I need to share this delicious summer salad with you. It is so simple. If you can use a knife to cut a tomato, you can make this salad. Because of its simplicity, it is vital that you find the juiciest, ripest, heirloom tomato you can get your hands on. I recommend hitting your local farmers market, even better if you have a plant or two going in your own backyard. If all you can get your hands on is a flavorless, bred-for-shelf-life grocery store tomato, don’t bother with this salad. Everything hinges on the flavor of the tomato. If you haven’t had raw corn before, trust me, it is delicious. Cut straight from the cob into the salad, it tastes even juicer and sweeter than if you were to cook it for a few minutes on the stove or grill. Finish the cut vegetables with a few torn leaves of basil and a glug (technical term) or two of olive oil and you are finished. It is that simple. You do not need the recipe, but I will include one below just in case. Now get outside and enjoy the summer weather. Cut the tomato into thick slices and arrange on a plate. Sprinkle generously with kosher salt. 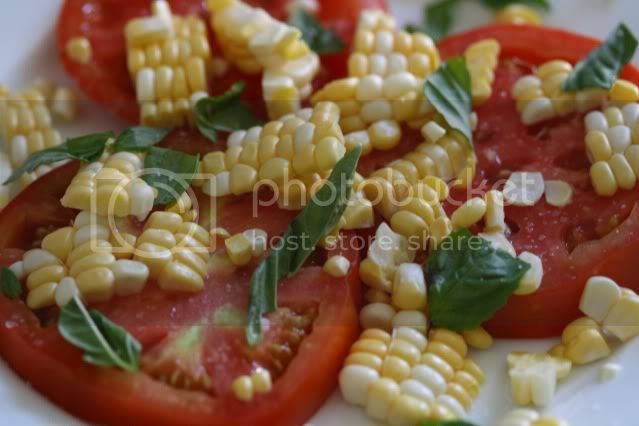 Cut the corn from the cob and arrange around the tomato slices. Tear the basil leaves in half or quarters and add to the plate (smell your hands to enjoy the basil scent left behind). Drizzle the salad with a little olive oil and vinegar and share with someone you really like. This is summer on a plate. Oh, yes. Perfection. I love the smell of basil. I use olive oil, but never vinegar in this type of combo. I'll give it a try. I think this is happening tomorrow. i think that is exactly what i am going to make upon return from the farmers market tomorrow-so simple and delicious. hope nyc is treating you well so far! Beautiful corn. Fresh off the cob can't be beat. I'm looking for easy dishes and this one fits the bill. Your salad looks wonderful-a symbol of Summer. Enjoy your day in Philadelphia. Yum! And so quintessentially summer! Oh yum! This sounds and looks amazing. Can't wait until the Australian summer rolls around again... I miss summer food! Oh my goodness does this look amazing. We eat a lot of tomatoes and basil and a ton of corn, but I don't know why I've never thought to combine them like this. Genius. Get them while we can I guess. Beautiful. Summer days are for savoring, not slaving away in the kitchen. Well done! Love the description of summer on a plate and I agree completely. This salad is simple but it looks absolutely perfect and delicious. Your photography is absolutely beautiful! Keep it up with the cocottes...but just know that you'll never ever do them again haha. I'm enjoying myself immensely here on A&B...can't wait to keep following, and make some of your awesome recipes. I will be trying this very simple salad recipe for sure. I've recently taken a shine to salads, so this is very interesting. Perhaps you could share any other salad recipes you have up your sleeve? hank you very much! Feel free to subscribe to my blog in the sidebar. Thanks for the wonderful words.